Inferior thyroid artery shown in relation to subclavian arteries and their branches. The inferior thyroid artery is a branch of the thyrocervical trunk, which is itself a branch of the subclavian artery. The inferior thyroid artery takes a sinuous course to reach the thyroid gland. First, it ascends for a short distance along the medial border of the scalenus anterior and under cover of the internal jugular vein; then, at the level of the cricoid cartilage, it turns suddenly medialwards and passes across the vertebral artery, behind the vagus, the sympathetic trunk, and the common carotid artery, to reach the middle of the posterior border of the thyroid gland. It then descends to the lower end of the lobe of the gland, and ends in tracheal, esophageal and glandular branches, the principal glandular branch running upwards again on the back of the lobe. 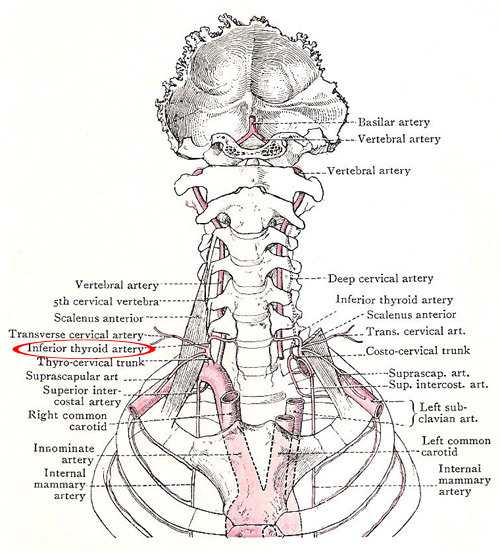 The inferior thyroid artery is not accompanied by a vein. The inferior thyroid veins run downwards over the trachea. The ascending cervical artery is a small but constant branch which runs upwards, on the front of the transverse processes, and gives branches to the muscles in front of the vertebral column. It gives off spinal branches also, which enter the vertebral canal upon the spinal nerves. The inferior laryngeal artery is a small vessel which accompanies the recurrent laryngeal nerve to the larynx. The tracheal, esophageal, pharyngeal and muscular branches are small irregular twigs. The principal glandular branch supplies the parathyroid glands on its way to anastomose with the superior thyroid.